What is electrical impedance myography? $1M ALS Biomarker Prize Has Been Won! But what exactly is electrical impedance myography? "Currently, researchers rely on death or use of a ventilator as the primary endpoints in ALS trials, measures too crude and slow to quantify drug effects early. The new test tracks disease progression with a noninvasive device that measures how electrical current travels through muscle, which degenerates as ALS progresses. Scientists can also measure muscle conductivity between needle electrodes implanted into muscle, but those methods are harder to perform and less reliable than the new device, besides being painful for patients. 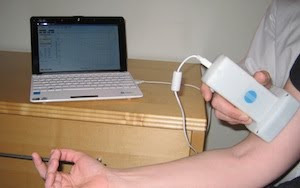 Rutkove's handheld device measures the electrical field generated when current runs through the muscles underneath electrodes placed on the skin. The $16,000-$20,000 unit attaches to a laptop or personal digital assistant-like device. The test takes about 20 minutes and detects abnormalities even before a person notices muscle weakness. Rutkove has also suggested that electrical impedance myography might help doctors diagnose ALS, although it may not be able to distinguish ALS from other neurological conditions that affect muscle (Rutkove, 2009). The method does differentiate between neurogenic ALS and some myopathic conditions such as inflammatory myopathy (Garmirian et al., 2009)." And here is a description of the technology in Dr. Rutkove's own words. After a 2009 review of potential ALS biomarkers published in The Lancet did not include a mention of electrical impedance myography, Dr. Rutkove wrote a letter to the editor that details his work and the potential impact of EIM. Now, firmly in the limelight, Dr. Rutkove's technology is attracting interest from drug developers eager to make ALS clinical trials cheaper, faster, and more efficient. Dr. Rutkove has co-founded Convergence Medical Devices to create and market a version of the technology that can easily be used in clinical settings. And while this biomarker has no direct therapeutic value, it holds the promise of accelerating the discovery of treatments or a cure for this disease--the mission of Prize4Life and the hope of thousands of patients and families around the world. In 2006, the founding members of Prize4Life organized a conference with some of the leading minds of the ALS research community and the biotechnology industry to answer a simple question: why, after more than 140 years since it was first described in scientific literature, is there still no effective treatment for ALS? Participants at the conference identified several key challenges in the field, but perhaps the most fundamental obstacle that had yet to be overcome was the need for a biomarker, a tool that could reliably track the progression of the disease in patients during clinical trials. Because the progression of ALS is highly variable among individuals, the only ways that researchers could gauge whether a potential treatment was having any effect was to measure survival time or use a subjective survey of a patient's ability to walk, talk, speak, and swallow. The ambiguity of these measurements meant that clinical trials needed to enroll a large number of patients and last for a long period of time. Expensive and often inconclusive clinical trials meant that industry had little incentive to invest in drug development and any progress in research would be painstakingly slow. Prize4Life now had a clear objective. In 2006, we partnered with the open innovation platform InnoCentive to launch the $1M ALS Biomarker Prize with the goal of identifying a biomarker that could more sensitively track the progression of ALS and dramatically reduce the cost of clinical trials. It was our intention to catalyze a breakthrough, a leap forward in ALS research that would accelerate the development of a treatment for the thousands upon thousands of people battling this disease across the globe. Now, five years later, we are proud to announce that a breakthrough has been achieved. Our Scientific Advisory Board, made up of the top minds in the ALS research and biotechnology communities, unanimously voted to award the million-dollar prize to Dr. Seward Rutkove, a neurologist at Beth Israel Deaconess Medical Center in Boston. The New York Times profiled Dr. Rutkove and the Prize4Life award. Dr. Seward Rutkove’s biomarker, using a method called electrical impedance myography (EIM), sensitively measures the flow of a small electrical current through muscle tissue. The current travels differently through healthy and diseased tissue, and by comparing the size and speed of the electrical current, EIM can accurately and efficiently measure the progression of the disease. Read more about the EIM technology here. This biomarker will make ALS clinical trials cheaper, faster, and more efficient; effectively cutting the overall cost of these trials in half, creating an incentive for industry to invest in ALS, and accelerating the progress of potential therapies through the drug development pipeline. The development of Dr. Rutkove's biomarker is not only a game-changer for ALS research, it is a validation of the prize model's role in driving biomedical innovation. The $1M ALS Biomarker Prize is the largest prize ever awarded in response to a specific medical challenge. The million-dollar purse leveraged more than $4M in investment from teams competing for the prize. And more than 1000 solvers from over 20 countries signed up for the challenge, bringing new minds and new ideas into the fight against ALS. You can learn more about the impact of the prize on biomarker research here. Now, we at Prize4Life are turning our attention to overcoming the next obstacle: the identification of promising drugs that can slow the progression of ALS. It is the focus of our second million-dollar challenge, the $1M ALS Treatment Prize. We invite you to learn more about Prize4Life and join our efforts as we continue the march toward a cure.